L 23-25 cm. Breeds in open, cultivated country, in orchards, gardens, parks, lines of trees, vineyards etc. Has expanded NW during 1900s. Food insects, also fruit and berries. Nest entrance c. 5 cm in diameter. 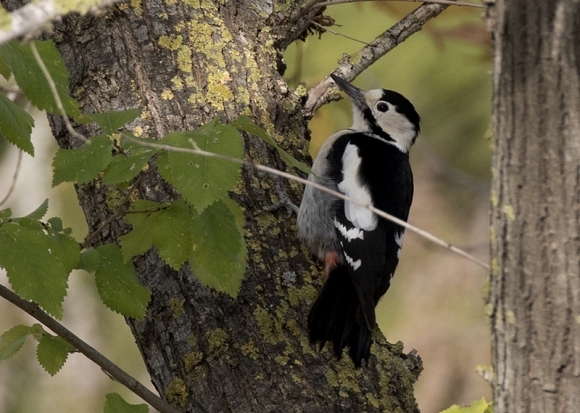 IDENTIFICATION: Very like Great Spotted Woodpecker: male black and white ‘pied’ woodpecker of same size and with only small red patch on hindcrown on male and all-black crown on female, also with large white shoulder patches and red vent. Close observation needed for safe distinction; note: no black line joining black central nape band with black angled stripe on neck-side (safest feature on adults); somewhat longer bill; pale nostril feathering (Great Spotted black); less white on outer tail-feathers. (only a few white spots at tip of black outer rectrices; Great Spotted has narrowly barred white tail-corners); on average cleaner white head-side and paler forehead (Great Spotted usually has dirty white cheek and brownish-white forehead, but occasionally identical); sometimes a few faint grey streaks on lower flanks and belly (never shown by post-juv. Great Spotted); on average less intensely red vent (but odd birds are similar); often slightly bigger red hindcrown patch on male than corresponding one on Great Spotted (but a few are the same). - Juvenile: Streaked flanks. Often reddish on breast. VOICE: Common kick-call is softer than Great Spotted’s and often surprisingly like Redshank’s alarm-call, ‘gipp’; when highly agitated this can be repeated in rapid series, ‘gip-gip-gip-...’, and also intermixed with a ‘chirrr’. Also has thick chattering ‘chre-chre-chre-...’ (like Great Spotted’s). Drumroll resembles Great Spotted’s, but can usually be separated by being longer, 0.8-1.2 sec., and by decreasing somewhat in volume towards end (Great Spotted’s short roll is more abruptly cut off); faster strike frequency and shorter duration than White-backed Woodpecker’s. Young quieter than Great Spotted Woodpecker young.